As an umbrella organisation of national natural landscapes, EUROPARC Deutschland e.V. gives a common voice to German national parks, biosphere reserves, nature parks and wilderness areas. The Lower Oder Valley National Park is one of them. 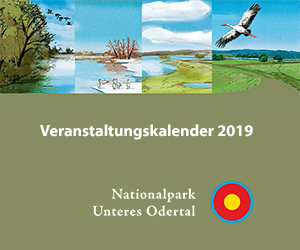 The Lower Oder Valley National Park is networked nationally and regionally with other national parks and national natural landscapes as well as the regional partners that support and pass on the National Park’s vision. Since 2005, the German national parks, biosphere reserves, nature parks and wilderness areas have been united under the umbrella brand “National Natural Landscapes”. Common values, strategies and goals are brought closer to the public in words and pictures, for example, the logo. Here, the Lower Oder Valley National Park can be found in a family of well over 130 national natural landscapes in Germany. EUROPARC Deutschland, the nationwide umbrella organisation of national parks, biosphere reserves, nature parks and wilderness areas in Germany, founded in 1991, is the sponsor of the umbrella brand. The umbrella organisation EUROPARC Deutschland works as a non-profit and cross-party association to preserve, develop and make the most beautiful and valuable natural and cultural landscapes in Germany tangible. It initiates an coordinates nationwide projects in which the exchange of experiences and information in the areas of environmental education, volunteer commitment or quality management among the members is promoted. Together, new strategies are being devised for the conservation and further development of national natural landscapes. The goal is to strengthen and facilitate the social standing of the “National Natural Landscapes” in collaboration with the state and federal authorities, nature conservation organisations, foundations and companies. Beyond that, the organisation develops and implements projects for environmental and nature conservation in cooperation with foundations and companies. The provision of appraisals, statements, analyses, surveys, publications and exhibitions on environmental and nature conservation policy issues is also part of EUROPARC Deutschland’s spectrum of tasks. Every 10 years, all national parks in Germany are evaluated by an expert panel, including the Lower Oder Valley National Park as well. The quality criteria and standards for the German national parks were developed by the umbrella organisation. Through its membership in EUROPARC Deutschland, the Lower Oder Valley National Park has the opportunity to access a national and international network and use the experience and know-how from many protected areas.